Add a gorgeous hue with goodness of lightweight moisture to your lips with the Faces Ultime Pro Crème Lip Crayon. 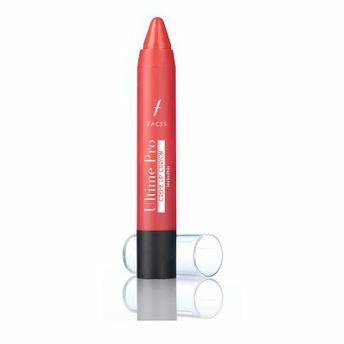 Boasting a velvety texture, this lip crayon glides on your lips effortlessly, giving you the perfect pout. The Faces Ultime Pro Crene Lip Crayons boasts a collection of beautiful nudes, stunning reds to pretty pinks and corals, formulated to suit the Indian skin tone. From timeless mattes and dazzling starry mattes, these delectable lip crayons are perfect instant glam. Available in matte and starry matte finish. Superior colour pigment and hydration. With a Canadian heritage, Faces Cosmetics products are hypoallergenic and conform to the most stringent quality and safety requirements. Offering exquisite line of make-up, skincare and personal care accessories, Faces has something for every woman. Faces’ wide range of shades, textures and designs are specially formulated to suit every Indian skin type, complexion and texture. Explore the entire range of Lip Crayon available on Nykaa. Shop more Faces products here.You can browse through the complete world of Faces Lip Crayon .Alternatively, you can also find many more products from the Faces Ultime Pro Creme Lip Crayon range.